The first thing you have to do when you’re getting ready to move is de-clutter. Discard. Get rid of things. I’ve done a lot. You can actually see my attic. I’ve made a hundred trips to the Lutheran Mission here in town with clothes and household items, and I’ve donated loads of books to the local library. And still, I have more stuff than I need or will want to take to Arizona with me. Whenever that happens. I’ve had two potential sales fall through. Nevertheless, I am getting ready. It will happen. So, I’m reading a book called the life-changing magic of tidying up by a Japanese woman named Marie Kondo. Ms. Kondo puts forth one very, very interesting idea. She asks you to pick up every item of clothing you own, every knickknack, everything you think you can’t part with, hold it in your hand, and ask yourself: “Does this spark joy?” If it does, keep it. If not, dispose of it. I tried this on one of my bookcases, one I thought I’d pared down. But when I held each book in my hand and asked the question, most of the books came down. Only my loved ones stayed. I was surprised. You see, Ms. Kondo says, this method of tidying is a dialog you have with yourself. A kind of meditation, a life-changing magic. A way to be surrounded only by things you love. Her question was still on my mind this morning when I decided to work outside. It was sunny and warm, and after three solid days of rain, I was in heaven. After a few chores, I noticed that the roses on my fence needed trimming. I had cut them back severely in the early spring, and they put on a spectacular show that peaked last week. Sitting on my back porch last week was better than being in a Chanel showroom. The perfume was more enchanting, and what a color – the palest, pale pink. Every time I looked at them, I felt a spark of joy. I didn’t know that’s what I was feeling – I was just feeling it. 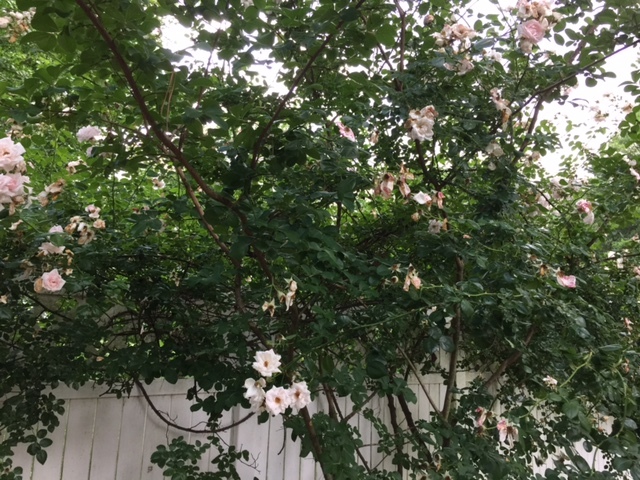 Today, I noticed that the roses – past their peak now – had invaded the miniature crepe myrtle tree in front of the fence. Oh, I sighed, getting ready to get the ladder and my clippers out. And then I noticed something. The little tree and the roses had their arms around each other. I just stood there, lost in their love. You can trim the roses when the blooms are gone, a little voice inside me said. They don’t last long. Let them stay where they are for now. Then, it clouded up and started to rain. I sat on the back porch. I watched it fall. I listened to it pelt the tin roof. Dorian the cat was sleeping in one of the chairs. And instead of complaining, as I normally would (haven’t we had enough rain?) I noticed how beautiful and lush everything was, how verdant, and alive. And the thought came to me: Maybe God thought you should stay here and enjoy this most glorious, green spring before you go to live in the desert. When I came to this house, there was nothing here except pine trees. I planted it all – the roses, the white hydrangeas, the wisteria, the Montauk Daises, the peonies, the crepe myrtle trees, the rings of hostas around the pines. All of it. I made a garden. Thirteen years later, it is mature. It is everything I envisioned. As I looked through the rain at it all, I felt a spark of joy. Whether it is sorting through clothes, or knickknacks, or just trying to get through a rainy day, if you’re looking for a spark of joy, chances are you’ll find it. It may be in a beloved book, or your favorite sweater, or the garden you planted with your own hands. It is there, just behind the right question. ← What Will People Think?